Brantford Sunrise donates $4,000 to Canadian Nurses for Africa. 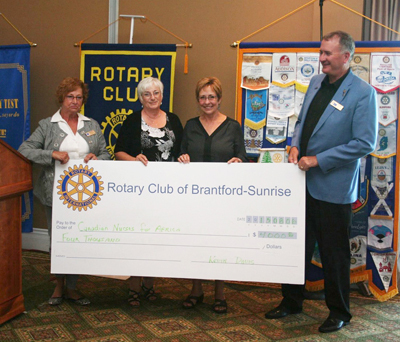 Brantford Sunrise Rotary donates $4,000 to Canadian Nurses for Africa. "CNFA is a nurse-led volunteer organization empowering nurses to use their highly developed skills and knowledge in a field setting. We conduct medical missions to Kenya where we partner with Kenyan medical personnel and community workers. We treat a wide range of illnesses, with malaria and upper respiratory problems being the most frequent. We also treat many wounds and do point-of-care diabetes testing. Along with our daily clinics, we conduct sexual health education classes for men, women and students, deworming programs in schools, a jiggers eradication program and finance the building of school latrines. We also provide hospital care for the acutely ill that are seen at our clinics."